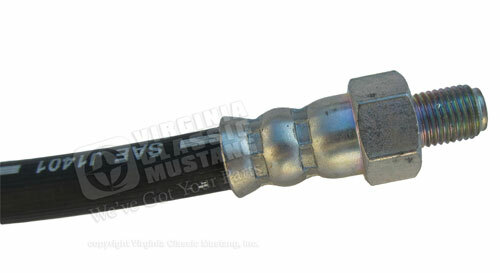 Front brake hose for 1965-66 Ford Mustangs and 65-66 GT350 Shelbys with disc brakes. This will fit the LH or RH. This is the hose for the 3/8" inlet calipers which should be the size on most all 1965-66 models. This hose is the replacement style. It works perfectly fine, but the plating is a clear silver and the end that screws into the caliper does not look like the original. DOT approved. Click on "more images" above to see a close up of the caliper end. Sold each-2 required per car. We now have the correct looking hoses. Please see our part number BK1001.